Research suggest that Hispanics in the U.S. are disproportionately affected by the consequences of intimate partner violence. Nevertheless, few intimate partner violence prevention interventions have been developed to address the unique needs and preferences of this population. The Partnership for Domestic Violence Prevention is a community-based participatory research project that assessed the needs and preferences for prevention programs for Hispanics in Miami-Dade County. Nine focus groups with domestic violence service providers, victims and general community members were conducted (N = 76). Four major themes emerged from the focus groups. These included immigrants and teens as the highest priority groups to target in prevention efforts, culture as a double-edged sword, the system that helps and hurts the victim, and the need for wide-scale prevention programs that would reach Hispanics systematically. 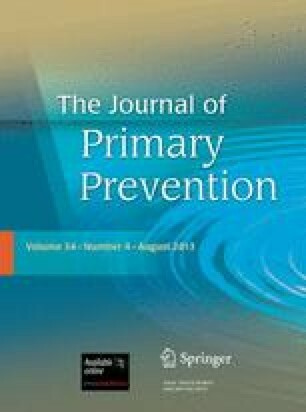 The results from this study have important implications for the development of intimate violence prevention interventions targeting Hispanics in the U.S. Primarily funded by the National Institute of Minority Health and Health Disparities (NIMHD) Grant 1P60 MD002266 to Nilda Peragallo, PI. Supplemental support from the University of Miami Provost Award, University of Miami School of Education and Human Development, the University of Miami School of Nursing and Health Studies, and the Coordinated Victim Assistance Center (CVAC), Miami-Dade County Community Action and Human Services Department was also obtained. The research team also would like to acknowledge the Community Advisory Board and participants of this project. Centers for Disease Control and Prevention, CDC. (2010a). Intimate partner violence: Definitions. Retrieved November 2, 2012, from http://www.cdc.gov/violenceprevention/intimatepartnerviolence/definitions.html. Centers for Disease Control and Prevention, CDC. (2010b). Youth risk behavior surveillance—United States, 2009, MMWR 2010: 59 (No.SS-5). Retrieved January 12, 2011, from http://www.cdc.gov/mmwr/pdf/ss/ss5905.pdf. Centers for Disease Control and Prevention, CDC. (2012). Dating matters™ initiative. Retrieved December 7, 2012, from http://www.cdc.gov/violenceprevention/datingmatters/index.html. Cuevas, C. A., & Sabina, C. (2010). Final report: Sexual assault among Latinas (SALAS) study. Washington, DC: National Institute of Justice. Retreived on September 8, 2011, from https://www.ncjrs.gov/pdffiles1/nij/grants/230445.pdf. Gallardo, M. E., & Paoliello, Y. (2008). Familism. In F. T. L. Leong (Ed. ), Encyclopedia of counseling. Sage Publicatoins, Inc. Retrieved December 10, 2012, from http://knowledge.sagepub.com/view/counseling/n378.xml. Tjaden, P. & Thoennes, N. (2000). Extent, nature and consequences of intimate partner violence. Atlanta, GA: National Center for Injury Prevention and Control, Centers for Disease Control and Prevention. Retrieved on June 14, 2009, from https://www.ncjrs.gov/pdffiles1/nij/183781.pdf. U.S. Census Bureau. (2008). Hispanic population of the U.S. Retrieved on June 14, 2009, from http://www.census.gov/population/www/socdemo/hispanic/hispanic.html. U.S. Census Bureau. (2012). About Hispanic origin. Retrieved on June 6, 2013, from http://www.census.gov/population/hispanic/about/.